We recently decided that there is a real need to make some new aromatic bis(heterocycles) that contain boron (http://pubs.acs.org/doi/full/10.1021/acs.orglett.5b02741)… This sounds rather random and you might ask – why? I have a theory that the idea of diversity-oriented synthesis has been widely misused by the organic community. Below you see a slide I like to show in order to make my point. This harkens back to something I already mentioned in the past, namely that chiral centers really hurt discovery of novel protein binders (once you have a target, I am not discussing phenotypic screens). I primarily refer to fragment-based binders that are useful in finding bioactive molecules. There is nothing inherently wrong with having chiral centers, but they must enter the picture at the “right time”. This corresponds to the point when target specificity needs to be built (this is development, not the initial discovery). When chiral centers are considered too early (think of all those collections that contain obscure compounds with complex 3D structures), there is too much bias and chances to discover binders to a particular protein target are smaller. 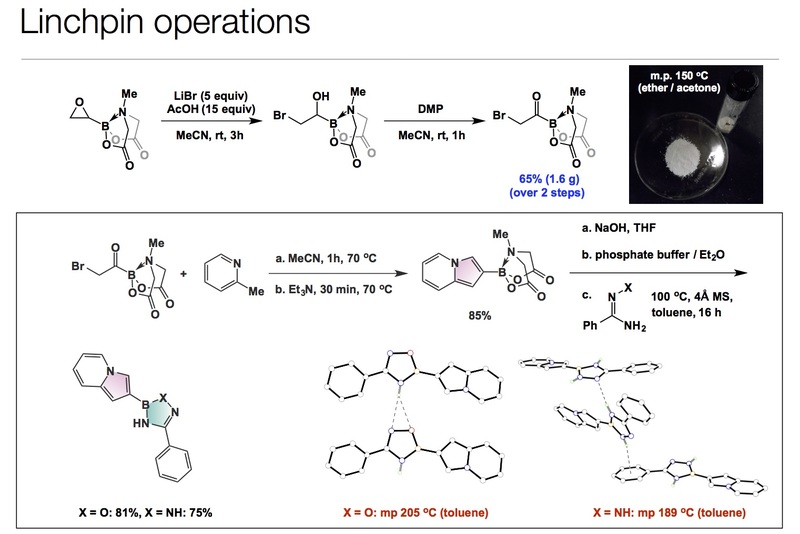 The idea of diversity-oriented synthesis has been a blessing to countless chemists by allowing them an easy way to defend reporting obscure compounds in their papers, but I don’t think there are many examples of utility against a chosen biochemical target. One might even propose that molecules can be chiral and less chiral. Don’t laugh: any oligo(heterocycle) devoid of chiral centers is, of course, bound to its receptor in a chiral conformation. In this case, I like to think of “weak chirality”. 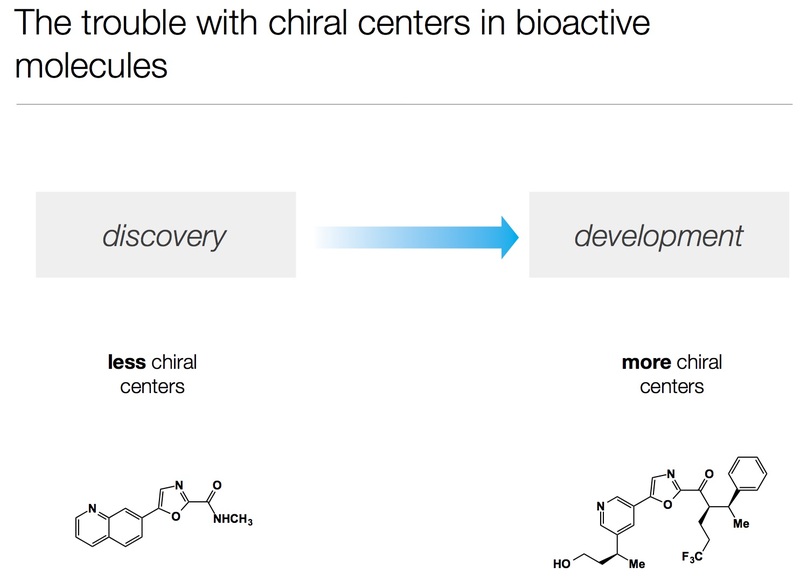 If you agree with the view that achiral molecules increase the chances of discovery, how might we innovate in 2D? One might surmise that there is no room for discovery as the vast majority of small aromatic heterocycles have been made. While this is technically not true, there are indeed real problems in designing something that is flat, composed of heteroatoms and carbons, yet novel. Enter boron. This element allows us to consider bis(heterocycles) that are unusual and totally novel from the standpoint of dipole arrangement. Are they stable across a wide range of physiological conditions? This is something we are trying to understand at the moment. For now, I would like to thank my students who have been involved in this project, primarily Dr. Shinya Adachi (now back in Tokyo, working with Professor Shibasaki) and Sean Liew (who is still with us). please have you tried a reaction of boronic acids with nitrile-N-oxides? Interesting that you ask… This is a cool. I can tell you that we recently made (well, detected – these were intermediates…) molecules that contain both boronic acid and nitrile oxide within them! While this is a different story, we are very keen on the reactivity between these groups as well. Oh yes – you are right. Good eye! But for sure with boron the diversity is even broader. Yes, I agree – in fact I even mentioned this paper in the past, it is a nice one!